In the last year I often had to held live presentations of Eclipse development. At that point a typical problem is, that the font sizes used during development are too small for the projector. The possible solutions are either ignoring this fact, using a special environment, where all the appropriate settings have been made, or tweaking the development environment. The tweaking will not work, as several settings should be made, and they are easy to forget, while the special presentation environment seems too much of a hassle for me. This left as the only choice to ignore the fact. But finally I had some hacking time, so I created a Presentation theme for Eclipse, that solves tweaking by a single selection of the user interface: Themes can be selected in the General/Appearance tab on the Preferences page. Currently, the theme description is a bit hacky: for every platform the default font is copied by hand to the plugin.xml (using a Windows 7, a OpenSuse 11.3 Linux and a Snow Leopard machine). More research is needed to solve this in a more generic way. Luckily only four fonts have been redefined by the theme. Some things missing: support for resizing elements in JFace viewers (such as EMF tree editors or CNF views), and the theme was not tested with graphical editors – although they can be resized using the Zoom control. I’m looking for some feedback, or either alternative implementation ideas; I think, others have already met these problems. The source is available from GitHub. Sounds interesting. I’m missing a screenshot which shows the result. Are you changing the font size in the editor or more? Four font sizes are changed: the editor font, the editor block selection font, the dialog font (used e.g. 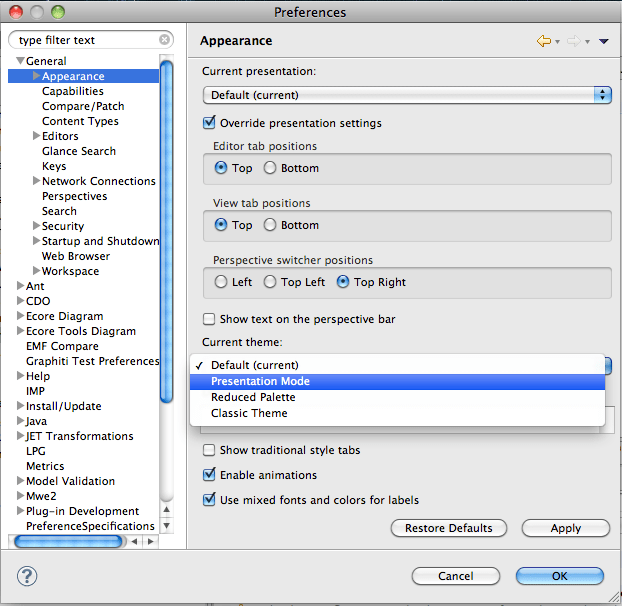 in the Preferences dialog) and the View header font. I added two screenshots to show what is changed using the Presentation theme. Alternatively, if the only thing you really need to change is the editor fonts, then the “fontsize” plugin (https://marketplace.eclipse.org/node/630774) might make more sense. With this installed, increasing the font size takes a single keypress (probably need to press it 2-3 times for presentation-viewable fonts), and resetting to the original font size takes a single keypress. Thanks for the recommendation. I had more general ideas about this plug-in what should be changed (e.g. font sizes in tree views, etc. ), but I never got around to implement them. Luckily, the CSS-based formatting for the 4.x API should make this possible, and I am interested in the limitations. If I will have time, I will try to extend this plug-in in the future. But in the meantime, the fontsize plug-in seems a right alternative.